I made 4 egg tracers and passed them out. While the kids took turns tracing the eggs on the card stock and then cutting them out, I ripped off strips of masking tape. Everyone got 4 pieces. The kids stuck the tape on their egg shapes. I gave everyone some water and coloured chalk. 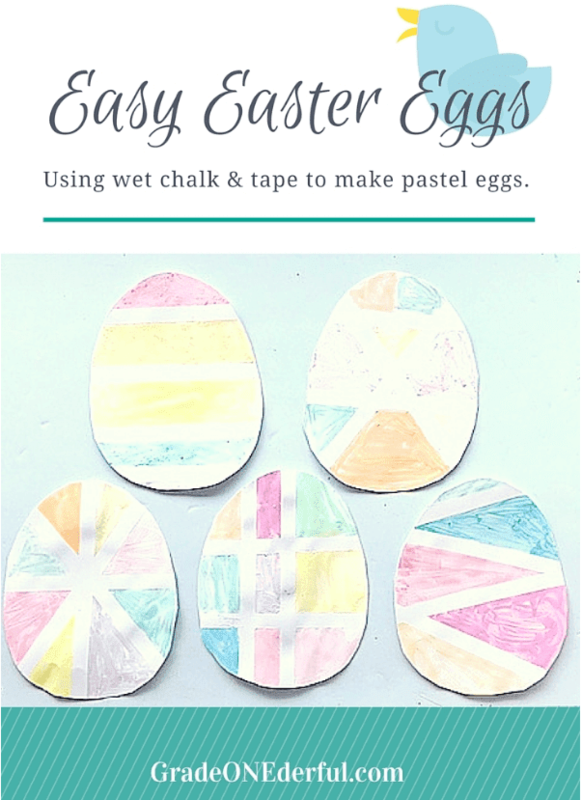 They dipped their chalk into the water and then coloured each section of their egg. Some kids soaked their chalk and others just did a quick dip. It didn't seem to matter which method was used. When the chalk dried (it took about 20 minutes), we peeled off the tape and voila! beautiful Easter eggs. We used shiny card stock which worked fine, but I think next time I'll use matte paper with a slight texture. As you can see we used white paper, but the eggs would probably look really gorgeous with pastel-coloured paper, too. Last year we made shaving cream Easter eggs and these really adorable bunnies (same post).